The function of a Stainless Steel 45 Degree Elbow is the same as a 90 degree elbow, but the measurement of dimensions is different to that of the 90 degree elbow. The radius of a Stainless Steel 45 Degree Elbow is the same as the radius of the 90 degree L.R. elbow where ‘R’ equals 1½D. However, the centre to face dimension is not equivalent the radius as in 90 degree L.R. elbows. This is measured from each face to the point of intersection of the centre lines perpendicular to each other. This is due to the smaller degree of bend. 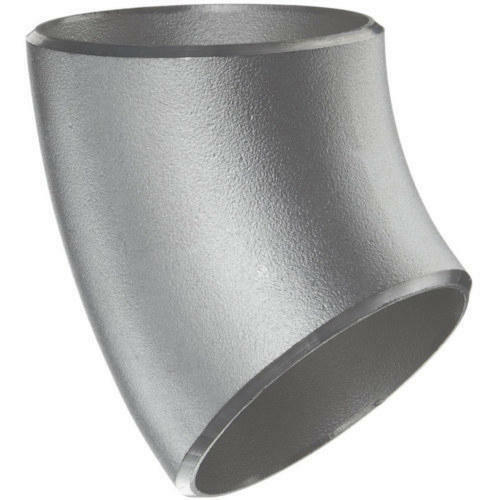 Stainless Steel 45 Degree Elbow, also called “45 bends or 45 ells” are typically made as LR (Long Radius) elbows. Available in various sizes (in mm or inches), 45 degree pipe elbow is available with different male to female BSP thread connections. Providing a wide choice of colors, these elbows can be manufactured to meet different specifications, in terms of size and diameter. They can be made from different materials like 3 ply material, silicone etc and both long and short radius elbows are available in the market. Established in the year 2007 at Mumbai, (Maharashtra, India), we “Uniflex India” are engaged in manufacturing, exporting, wholesaling and retailing a comprehensive range of Stainless Steel Plates, Stainless Steel Sheets, Stainless Steel Tubes, Stainless Steel Pipes, etc. These products are examined on various quality parameters before final dispatch. These products have remarkable quality and finish. Quality being our forte, we have a firm conviction in maintaining international standards in the entire assortment of products offered by us.